First 200 km for the a day. Testing myself to see if I have the staying power to do a long single stage race. Saturday before last I set out across a few dirt roads then on to some paved roads in the direction of Thabazimbi. I passed Bella Bella where I purchased some food for lunch then chose the Thabazimbi road. Not a good road for cycling as there is no sholder. The vehicales tend to push you off the road. On route I passed a few well known lodges. One been Mabalingwe where we sometimes take foreign contractors that do work for us. Then there was the turning to Mabula and Adventures with Elephants. This is an area that is Maleria free and close enough to drive out from Johannesburg or Pretoria. 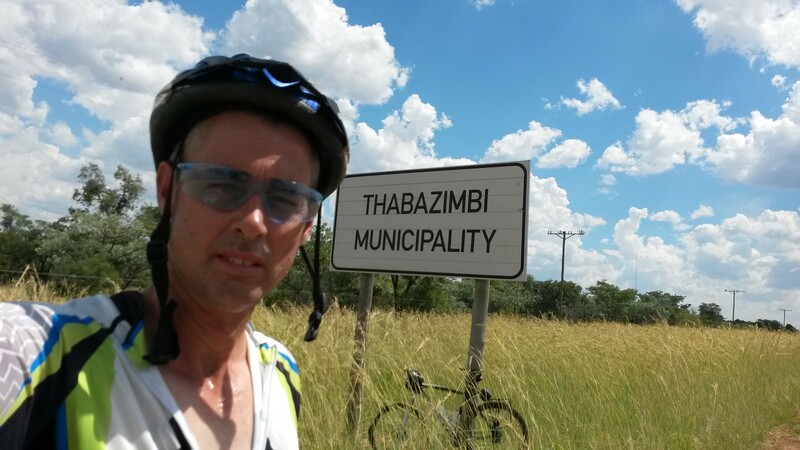 I turned back home when reaching the sign that said Municipality of Thabazimbi. Did 200 km for the day. Temperature went to 44 degrees Celsius. Used the heart rate monitor to make sure of a even work out. Found the distance was not a problem. Only problem was to get myself refueled. Will have to look into food that can help me to sustain performance. Things look good. Almost ready to take the step to register.